Okay, I know, I know. Everyone is a little bit Irish on St. Patty's Day. I myself am a huge advocate of bringing out my inner Celtic lassie all year long, but on this weekend, might as well be a no brainer. I have the absolute advantage of living in one of the most historic Irish neighborhoods in the city, South Boston, and the pride here is fierce. I'm telling you, if you aren't celebrating in Southie this weekend, you are missing the boat. 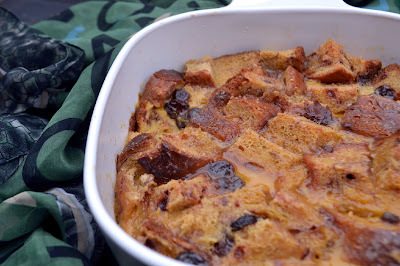 This Irish Bread Pudding can be made with traditional Irish Soda bread, but I made some changes to the recipe. Feel free to try it out, but I can only attest to what I did. All I know, is that when I cracked open the Bailey's to make this this morning, is that I may have poured a little bit in my coffee. I told you, I'm Irish. And you will be too, or if nothing else, you will soon be feeling good enough to do yourself a little jig. 1. Preheat oven to 300 degrees and melt your butter into a 2-quart casserole dish. Prepare a water bath for the 2-quart casserole dish by placing a larger dish with water in the oven. 2. Place bread cubes in the 2-quart casserole dish. Meanwhile, beat together the eggs, white sugar, vanilla and nutmeg. 3. Bring milk to a small simmer in a sauce pan, and let it scald briefly. Add Bailey's into the milk and then pour liquid slowly into the egg mixture. 4. Pour mixture over the bread cubes and if desired, sprinkle with brown sugar and raisins. Place the casserole in the water bath and bake for 50 to 60 minutes or until a knife inserted in the middle comes out clean. Server either hot or chilled. Oh dear, pudding with Irish cream sounds just wonderful! This was delicious. I could have eaten that, deviled eggs, and cake-muffins all day!